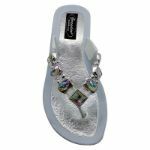 Grandco’s stunning white sandals are created from superior quality materials, with a manmade upper and sole, arch support, a full-length midsole, and a low wedge heel. 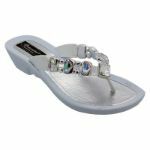 Experience all day comfort when you choose this classic sequined slip-on for a leisurely day out – it’s the perfect fit to anyone’s style. Now, complement every edgy look with this traditional and dainty shoe!